This postcard was produced by Sydney Hall Photographer & Picture Framer, Forest House, Edwinstowe. The reverse side of the card reveals it has a Mansfield post mark and was posted in 1928. The photograph is taken in the grounds of Forest Town Institute, the Avenue houses can be seen in the back gound. 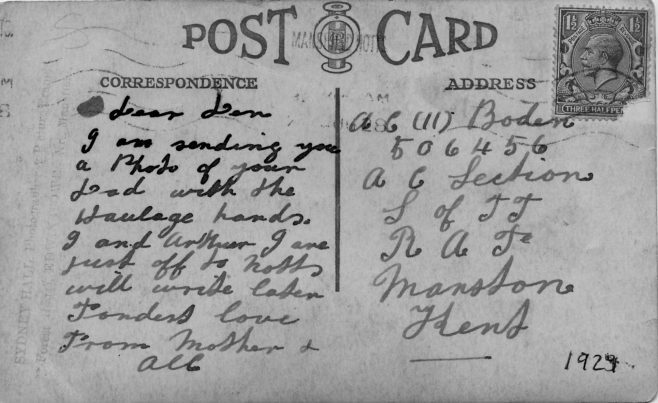 Mrs Boden writes to her son that it is a photo of his dad with the haulage hands [from Mansfield Colliery]. The Boden’s were I believe, a Forest Town Family, maybe someone knows more about them? What is a mystery to me is the game with the Daily Mail ball, how was it played? was it an annual event? how was it instigated by the Daily Mail? Can anyone help with more information please. I am currently researching my partner’s family. His grandad was Douglas Thomas Boden, born in 1907. His brothers were Dennis, Thomas, John Arthur, his sister was Elsie. His dad was called Arthur and his mum was Frances, I believe.They lived at 6, First Avenue. Would they be any relations to the Thomas in the picture? This is my Grandmothers Uncle Thomas Boden, my grandmother is Bessy Allen (Boden), She was a 100yrs old this week.Born in 1911 in the Avenues in Forest Town Mansfield. The lady writing to her son Den is my Grandmother’s Aunty. My grandmother(Nana) is a 100 this week and doing really well. Her uncle is the boss Thomas Boden. Nana’s father also worked in the colliery. They lived in the Avenues Forest Town.